The strawberry banana smoothie is power-packed with banana nutrition, has the sweet delightful taste of strawberries, and tastes so good even the kiddos will love it! The strawberry banana smoothie is delicious by itself or is a great recipe to explore by adding different ingredients to it. I will add ingredients such as raw sprouted grain protein powder, raw yogurt, honey, dates, hemp seeds, berries..the list is endless! Bananas gives the whopping potassium you need to energize and get you going..the nut milk gives you protein and creates a thicker consistency to the drink, and who doesn't love strawberries? 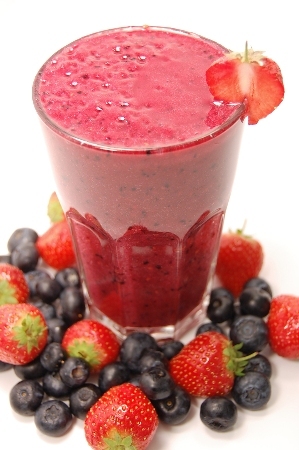 Add a scoop of raw protein powder and this also makes a wonderful after-workout smoothie! 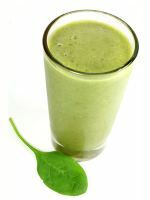 This IS a wonderful recipe to try switching up to green smoothies...are you a little hesitant? Adding greens vamps up the nutrition. The banana will "cut" the taste of the greens so you will not taste them. Add dark greens such as kale or spinach for the highest nutrition but I will also use any greens I have available. Start out just adding a little bit of greens. Most people work up to 40-60% greens but it is all up to your preference and taste. Another benefit is if you have children, they will be eating their greens and not even know it! Start noticing how much ingredients you are putting into your smoothie and you will realize just how much nutritive food you are drinking, often much more than you would ever sit down to eat. Because the ingredients are blended, they are easier to digest quickly and efficiently to give all of those vitamins, minerals, enzymes into your system fast! 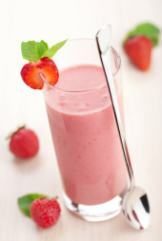 Combine all of the ingredients in a blender and blend until smooth. Serve immediately. Makes 1 generous serving or two large servings.